This entry was posted on Monday, April 21st, 2008 at 12:47 pm	and is filed under dinner, recipes. You can follow any responses to this entry through the RSS 2.0 feed. You can leave a response, or trackback from your own site. What about a smothered, Chimi. I have been making a recipe similar to this one for years. But, here is a little addition for ya. Once the chimi is plated up top it off with some Valentina Hot Sauce. This is sold in grocery stores and is about a buck for a 16 ounce jug! It’s not super spicy but more of a robust chili flavor. 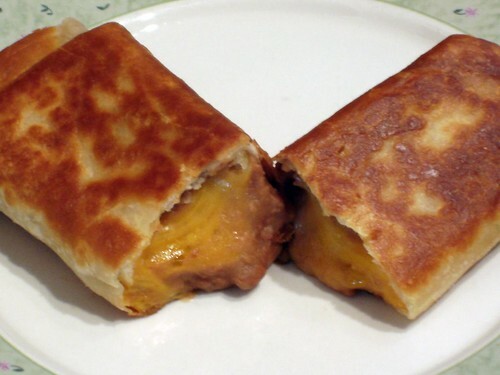 Next, add more cheese on top of the chimi and put in the toaster oven on broil at 400 degrees for about a minute. Garnish with scallions and ZANG! Ohh yeah. You can’t go wrong with more cheese! Sounds like good fixins. I’ll have to try Valentina Hot Sauce out. Thanks for stopping by! I like your step-by-step photos–looks yummy! marilynnscrafts – thanks! The chimichangas were definitely yummy. So yummy in fact, that they won’t accept regular bean burritos at home anymore, heh.